I joined SALT as an academic developer in September 2017 joining the Recognition Team which supports colleagues in their HEA Fellowship applications. I previously worked in Further Education teaching A level History and Government and Politics and I have been warmly welcomed by everyone in SALT. Since joining SALT I have had the opportunity to get a feel for the teaching that goes on in the university and I have been amazed at some the innovative and diverse teaching, learning and assessing that takes place here. When I initially started, I felt as though I had joined a team that spoke a different language! 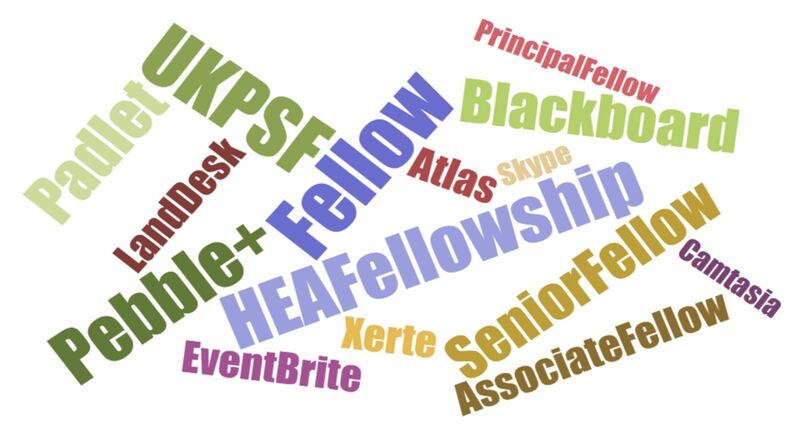 Not only did I need to get used to the language of HE as opposed to FE, but also the language and terminology of HEA Fellowship and the digital tools that have been embraced by the team. I initially felt ‘out of the loop’ and daunted by the fact that there was a lot more I had to learn than I expected. I would often leave team meetings and Google what certain words and phrases meant or what certain digital tools did. I have learned so much in the last 5 months, particularly in terms of the role of the HEA and the HEA Fellowship application process, but I also feel like I have developed in the way I think about teaching and learning. With the help of colleagues, I have been encouraged to embrace the use of technology in the training sessions I have provided. I have developed the number of digital learning tools I am able to use. When I initially joined SALT I felt like a different language was being used with discussion of Pebble+, Padlet and Xerte amongst others. However, with the support of my colleagues I have had the opportunity to not only learn how to use these tools but to also put that learning into practice and use them in the development of support sessions. I have also had the chance to learn the nuances of online learning compared to face-to-face teaching. As well as helping support staff in their HEA Fellowship applications, I am also working on my own Fellowship application which has allowed me the opportunity to stand back and take stock of how I teach, what type of teacher I am and the teacher that I want to be. One thing I found when joining SALT is how supportive and enthusiastic all team members are. There is always someone who is willing to explain to you what something is or means and to train you in how to use a digital tool or platform and how to get the most out of it. 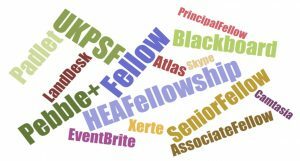 I started with learning about the HEA and HEA Fellowship and understanding the UKPSF, different categories of Fellowship and the criteria for each. By using the HEA websites and documentation, the SALT website and the support of my colleague, Louise Rees, I gained a good understanding of what HEA Fellowship is, the categories of the UKPSF and how to apply through the Swansea University route. The first new digital platform I engaged with was Pebble+, a platform I had not even heard of before let alone used. I made use of Louise’s support, along with the tutorials available on the Pebble+ site and simply practicing using Pebble+. I now feel confident in giving advice regarding Pebble+ in terms of how to use it, how to upload and link evidence, how to submit and general troubleshooting. I have provided a support session on Pebble+ and given advice via email and over the phone. Initially, I was hesitant and still trying to get my head around it, but now I quite enjoy the problem-solving aspect of giving advice for Pebble+. I was encouraged to use other digital tools such as Google Forms to create surveys and Padlet. I had been aware of some online surveys such as Survey Monkey and I knew that surveys were possible to create through Google Drive, but I had never created an online survey myself. I made use of video tutorials on YouTube to gain an understanding of how to create surveys and create links so that they could be emailed out to participants. Louise was really supportive and pointed me in the right direction if I had any queries. I ended up creating four surveys that were sent out to those who participate in the HEA application process. Out of all the new digital tools I have used, I found Padlet the easiest to get a handle on. I had never heard of Padlet before either, but after watching a couple of short YouTube tutorials I had created my first Padlet in 5 minutes. I have incorporated these into support sessions for the HEA, for example, I have created Padlets to allow colleagues to leave posts for top tips for applicants and top tips for reflective writing. While working in FE I had used Moodle, I had heard of Blackboard but never used it from a trainer/ teacher point of view. Blackboard seemed to have a language all of its own with “modules”, “organizations”, “adaptive release” and “build content”. I have had a lot of support from colleagues within SALT such as Helen Davies and once again Louise. Although I was a little daunted and overwhelmed by what Blackboard could do, I started off with the basics and I have now created content of my own on Blackboard. This year I plan to engage with online learning more. Before I started in SALT I assumed that online learning simple meant making your resources available electronically. However, I have learned that there is a lot more to online learning and a lot of consideration needs to be taken into account. My aim for this year is to become familiar with the language of online learning and learn how to use digital tools that support online learning. My colleagues in SALT have already started to show me what online learning is and how to approach it, in particular, Helen Davies who has introduced me to Xerte. I aim to start to learn how to use online learning tools and to build some online learning content and resources. So what have I learned? Although it may seem initially that some colleagues speak a different language, that language can be learned. The support and know how is available from colleagues, particularly in SALT, to help learn about different digital tools and platforms that can enhance teaching, learning and assessment. The digital tools I have learned to use have proved effective and are intuitive making them easy to master. I’m looking forward to learning, even more, this year and pushing myself further.